The poker chip carrier is the poker chip case you will want to use if you are transporting your chips a lot. The 100 chip trays are used with these cases. The chip trays stack neatly inside of carriers and help organize your chips. The poker chip carrier is available in two sizes/styles. 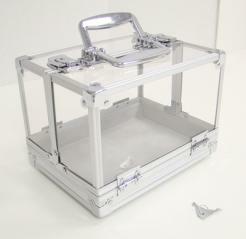 The larger, 1000 chip style has a clear acrylic "bird cage" lid that lifts off. The smaller, 600 chip carrier has a "clam shell" style opening top. These poker chip carriers also work perfect with less chips, they don't need to be completely filled. 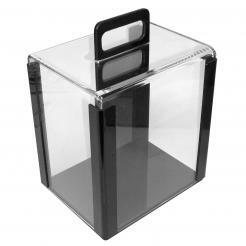 The 1000 poker chip carrier is the same carrier that is used in almost all casinos and card rooms. The reason; it is the best way to store and transport chips. Because the chips are already organized in rows of 20 chips, it makes it very easy to count out the chips.